6 Clever Ways to Use Glass Jars in the Kitchen | Finding delight. Create a soap dispenser and buy your liquid soap in bulk. It looks more adorable anyways and you can cut down on plastic packaging. Store your spices. This is a great way to re-use baby food jars if you’ve got a little one. Grow a counter-top herb garden. You’ll get to top your dishes with kitchen-grown parsley and basil. What could taste better? Store your dry goods — like sugar, flour, beans, pastas, and coffee. If you shop the bulk bins you can bring your jars along to the store and take everything home in the same containers they’ll be stored in. (Just don’t forget to weigh them empty first so your cashier can subtract the tare!) Pretty enough to display proudly on open shelving and you’ll always know how much you have left! Use larger jars to store your cooking utensils (whisks, spatulas, wooden spoons, etc). If you’re in a tiny apartment where kitchen drawer space is at a premium, you could even keep your eating utensils in jars right on your table. Setting the table will be a breeze! Finally, my all time favorite way to use a jar in the kitchen… 1/2 gallon mason jar + immersion blender = a super inexpensive blender alternative that works just as well, is easier to clean, and takes up hardly any storage space. 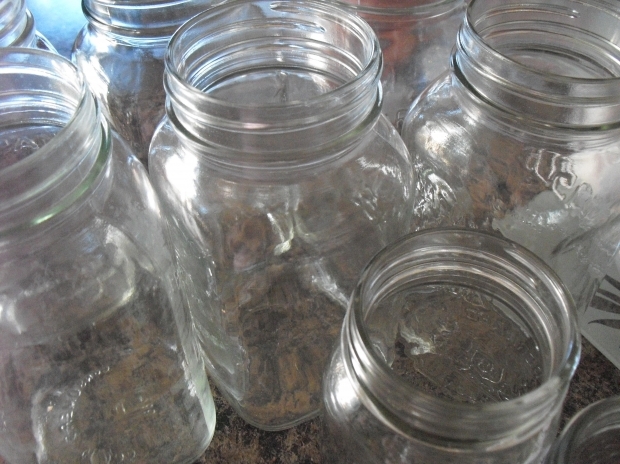 What’s your favorite way to use glass jars? Do you have uses for them beyond the kitchen? Any other items you love to save and re-purpose? Share your ideas and tips below! I really should save glass jars for leftovers at least! I always feel guilty sending them off for recycling after one use…but hey, at least I’m recycling them! They are totally handy for storage…but then again, I tend to lose tupperware like it’s my job, lol.